Songs have been written about Britain’s dominance at sea, and this run will take you through the heart of Britain’s maritime heritage. It starts in the Canary Wharf business district, which was once a bustling port, heads south through the interior of the Isle of Dogs to Greenwich on the south bank of the Thames (via the foot tunnel). Then it comes back following a small section of the 184-mile Thames Path. Start: Jubilee Park. From the southwest corner of the park, head south and cross the impressive South Quay Footbridge, then turn left keeping to the bank of the South Dock. Interest: This area was once the international hub of cargo shipping, but in the 1980s was given a total overhaul to make it a key area of finance, including skyscrapers and many people wearing suits. One Canada Square is the largest building in the area (and the second tallest in the UK at 235m high), identified by its pyramid-shaped roof. 0.3mi: Millwall Docks. When you hit the adjoining waterway of Millwall Inner Dock, turn right and keep to its west bank passing under Marsh Wall and the DLR line. At 0.7mi cross the dock using the Pepper Street bridge. Turn right and follow the dock’s east bank until you reach a small park with an underpass on your left. Leave the dock by following this underpass. Interest: The Inner and Outer Millwall Docks were opened in 1868 and were ports for the timber and grain industries and more recently was the location for filming of the James Bond installment The World is Not Enough. 1.0mi: Mudchute. After passing under the rail line, cross East Ferry Road and enter the gate directly opposite into Mudchute Park. Head up the steps and veer right following the narrow trail south to exit the gate 250m later. Head southwest (left out of the gate), following the sealed trail around the Mudchute Park sports fields. Exit the park near the Island Gardens Station, cross Manchester Road, continue south via the path opposite, and cross Saunders Ness Road to reach Island Gardens and the dome-topped entrance to Greenwich Foot Tunnel. Interest: Mudchute Park occupies an area of land that was the dumping ground for mud and silt extracted from the nearby docks. 1.6mi: Thames Tunnel. The Greenwich Foot Tunnel is open at all times and has either a lift or a spiral staircase (real runners only ever take the stairs, so the latter obviously only interests you!). The tunnel is 400m and ends with another lift/spiral staircase. Immediately outside the tunnel exit is the Cutty Sark. Run along the eastern (left) side of this old ship and follow the King William Walk south past the Naval College and over two roads to Greenwich Park. 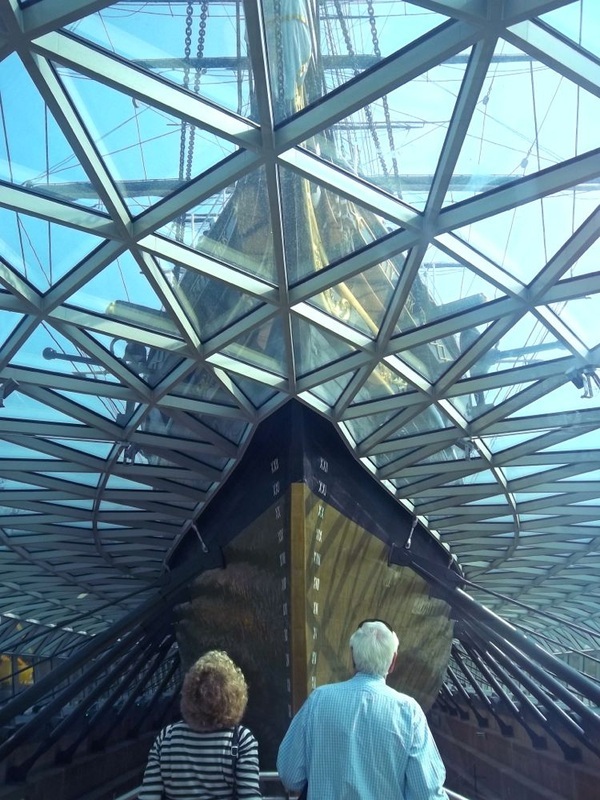 Interest: In the 19th century the Cutty Sark worked in the tea trade between Asia and the UK and later the wool trade from Australia (holding records on this route). The Greenwich Foot Tunnel has a sister tunnel downstream in Woolwich and together they transport 1.5 million people under the Thames every year. 2.15mi: Greenwich Park. Follow the main road south through the park for 650m to head up the hill to the roundabout (there are toilets near the top of the hill on your left). Turn left here and jog to the Royal Observatory and viewing platform. After a few photos, retrace your steps back to the roundabout and turn left (east) following Great Cross Avenue. Pass the bandstand and veer left. Pass the Roman ruins and veer left again to follow the trail along the boundary of the park. Head down the hill, turn left and then exit the park near the pond (there are more toilets near the pond). Interest: The Royal Observatory is home to the meridian line that marks zero-degrees longitude—so effectively you’re running to the ends of the planet on this run. You can pay to stand on the ceremonial meridian line, but there is also a small line of grey bricks near the ticket booth that also marks the meridian—you can stand on this one for free. 3.55mi: Greenwich Museums. You’ll exit the park onto Park Row; follow this street all the way north to the Thames. Turn left to run past the symmetrical grandeur of the Old Royal Naval College and back to the Greenwich Foot Tunnel. Interest: The Old Royal Naval College was originally opened in 1706 as a hospital for returning injured seamen. It is said that the building was split in two to allow an unbroken view of the Thames for the Royals staying at the Queen’s House (closer to Greenwich Park). 4.3mi: Thames Path, North Bank. Upon exiting the Foot Tunnel on the north bank, look for signs marking the way west along the Thames Path (look for the acorn symbol). You’ll spend the first 300m away from the river and then just over a half mile along the river’s banks as it bends back towards Canary Wharf. There is one more section where the Thames Path leaves the riverbank for about another half mile before re-joining the riverside past some impressive, new apartment blocks. Interest: The Isle of Dogs is called an island because of the combination of the 180-degree sweep that the river makes around it and the nature of the West India Docks (stretching from one side to the other) effectively creating a complete circuit of water surrounding the suburb. 6.2mi: Canary Wharf Again. The next time the Thames Path takes you away from the river (at 6.2mi) you will come to a roundabout where you need to cross over two roads to turn right onto Heron Quays. This street will lead you back to Jubilee Park, 6.6mi later. Terrain: One hill and some stairs, otherwise flat. Weather Warning: Cobbles/brick-pavers can become slippery when wet/icy. Traffic Warning: Some road crossings. Pedestrian traffic can be heavy during commuting hours in Canary Wharf and in the afternoons around Greenwich. Times: Greenwich Park is open between 6am and roughly dusk (6pm in winter and 9:30pm in mid-summer). Toilets: Canary Wharf Tube Station, Cutty Sark (charged), & Greenwich Park. 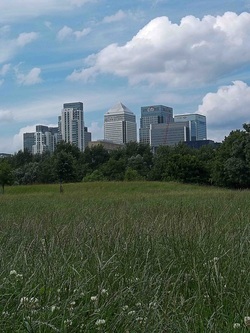 Start/Finish: Jubilee Park, Canary Wharf, Borough of Tower Hamlets, E14 (5.1mi east of central London). Rail: Canary Wharf Tube Station (Jubilee & DLR lines) is directly at the start area in Jubilee Park, Canary Wharf. Bus: 135, 277, D3, D7, D8, & N550. Car: Not advised due to insufficient parking and congestion. Thumbs Up: Oodles of maritime history and some great running terrain through a diverse mix of neighbourhoods. Thumbs Down: Some parts of the Isle of Dogs can seem a little solitary, but it does make a nice change from the hustle and bustle of both Greenwich and Canary Wharf.